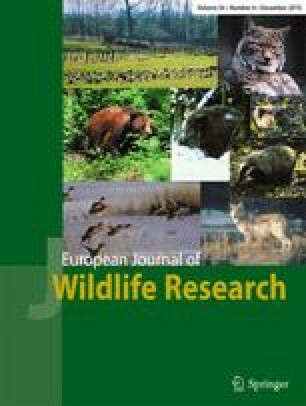 We present quantitative data on the impact of different causes of mortality in a Geoffroy’s cat (Leopardus geoffroyi) population inhabiting a protected area and adjacent cattle ranches in central Argentina. Between December 2000 and January 2009, we used three methods to collect data on causes of mortality in both the park and the ranches: (1) information obtained from 35 radio-collared Geoffroy’s cats monitored from 1 to 19 months; (2) a systematic survey of the areas to find non-collared dead animals; and (3) interviews of qualified informants. Deaths of radio-collared individuals in the park were due to predation by puma (Puma concolor) or starvation, whereas deaths in the ranches were attributed to starvation and predation by domestic dogs. The death of eight emigrant cats was attributed mainly to poaching. Cause of death of 39 non-collared Geoffroy’s cats was determined; deaths in the ranches were mainly due to predation by domestic dogs and poaching, whereas deaths in the park were attributed to predation by puma, poaching, and vehicle collision. Grouping all sources of information, human-related mortality accounted for most (62%) of Geoffroy’s cat deaths recorded during this study, with poaching and predation by dogs being the main causes of mortality. This study in Geoffroy’s cats is the first long-term survey of causes of mortality for a population of a small felid species in South America. We thank several volunteers, park rangers, and ranchers for their assistance during fieldwork and to the staff of the WCS for performing histopathology analysis. This study was funded by The Rufford Foundation, WCS–Global Health Program, Dirección de Recursos Naturales de La Pampa, Cleveland Metroparks Zoo, Roger Williams Park Zoo, and Amersfoort Zoo.